Vinyl is fast becoming the go-to material within the sign making industry and with good reason. 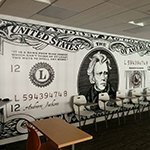 Boasting nearly limitless applications and options, vinyl can brighten any workspace or brand any vehicle, window, wall, floor, or surface! Vinyl is available in various types, colors, weights, and finishes, allowing us to recommend the best material for your particular needs and marketing ideas. We offer durable vinyl that is perfectly suited for outdoor use or in high-traffic areas so that you can add your marketing message anywhere you desire, from your windows to your walls, floors, even your vehicle! Not sure what type of vinyl product you want? Not a problem! Exemplar Signs & Graphics provides a free consultation with our knowledgeable signage staff, allowing you to speak with professionals who understand the various products, their applications, and how they can be used to maximize brand awareness and visibility, ultimately helping you to grow your business. Call Exemplar Signs & Graphics at (562) 213-9300 for your Free Consultation with a Vinyl Graphics Specialist! Vinyl banners, available in a huge range of different sizes, colors, weights, and display options, are our most popular vinyl product! 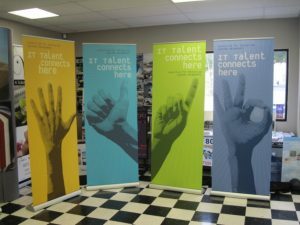 We print and manufacture all of our banners using durable, heavy-weight vinyl that proudly and professionally displays your marketing message or business information. They are ideal for controlling and driving customer traffic, supporting staff at an expo, or announcing your grand opening. 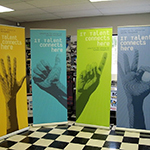 Whatever your business marketing goals may be, we will create the custom banner that works for you! 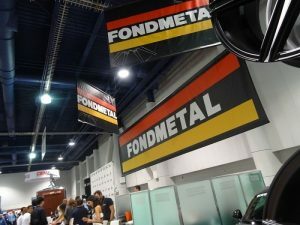 Whether you need off-site banners or a full display for a tradeshow, Exemplar Signs & Graphics understand your goals and will deliver the professionally crafted banner you need, complete with any accessories or equipment required for support or hanging. Various vinyl materials are intended to be used on windows and glass. Whether you want to engage your customers with a dynamic promotional window display or offer your customers or guests some privacy, we have the right vinyl product for any need! 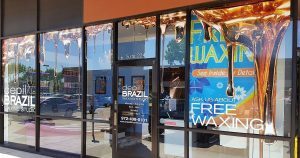 Window displays are made from cut vinyl elements and are applied to windows or glass through a static-cling adhesion or with temporary sticky glue. 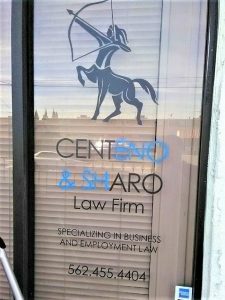 This type of window vinyl is ideal when promoting different sales or promotions that change frequently, or as new products and expanded services become available. Easy to remove and reapply, this vinyl product can be used for multiple applications when stored correctly and provides a budget-friendly option when promoting seasonal sales, new product lines, even returning sales events! 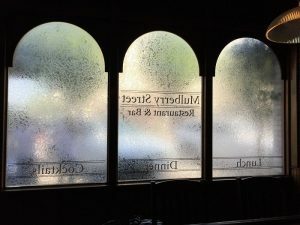 Privacy window film is fast becoming popular among professional service providers, offices, and restaurants that don’t want the expense or permanence of purchasing etched or frosted glass panes or those who work from a rented space and may not have the ability to remove and replace enter windows. 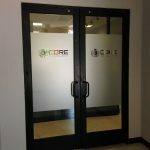 Privacy window film is available in a variety of textures and styles and can be easily customized with your logo, message, or other images to create the high-end, attractive finish that you have always desired, at a fraction of the cost. One of the best places to start improving the professionalism of your business is with your front door. There is specific information your customers expect to find even before they enter your business, such as your hours of operations, business licenses, accessibility, and other pertinent business information. 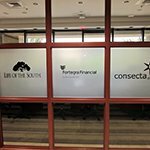 Cut vinyl graphics and lettering is an attractive and professional way of sharing this information and allows you to begin building the repetition you need for your brand to take hold by reinforcing your branding elements even before your customers enter your facility. Make a great first impression with cut vinyl letters and graphics. They are an excellent, cost-effective way to give your business a facelift instantly! Businesses are finding the power of vinyl throughout their entire facility and not just on their doors and windows. 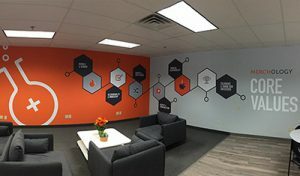 Large format vinyl graphics and murals can be applied to nearly any smooth surface, allowing you to maximize areas never before considered for brand identification, marketing, wayfinding, even as a way to tell your brand’s story. 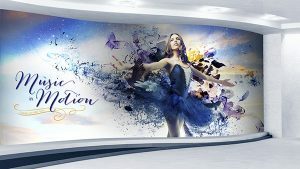 With attractive, durable wall murals by Exemplar Signs & Graphics, you can turn any dull wall or hallway into an engaging work of art. 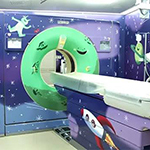 Our knowledgeable staff can help you determine placement, as well as assist with design, fabrication, and installation of any large formation graphic for a beautiful lasting finish. Your walls aren’t the only place you can market your business; your floors can also provide a fantastic opportunity for branding, wayfinding and customer support. 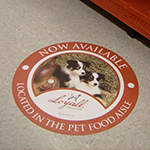 Our eye-catching, durable floor graphics can adhere to tile, wood, concrete, and even some carpets, allowing you to utilize almost any surface of your facility for promotion. 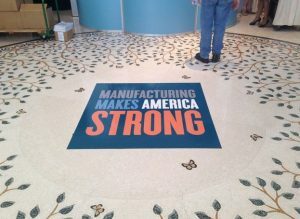 Dynamic and engaging floor graphics can are ideal for tradeshows and events, providing intuitive directional support to attendees. Vinyl offers a myriad of options for how it can be used for business promotion. Not only can you find a wide range of vinyl products, but just as many vinyl material and finishing options can be found. With a variety of colors, weights, and application methods, selecting the right vinyl sign can present a frustrating challenge, especially when ordering from a website. That is why we provide a free vinyl sign consultation with our signage experts. We listen to your needs and recommend appropriate vinyl options, providing product samples as well as design proofs so you get a firm understanding of what your final sign product will look like. 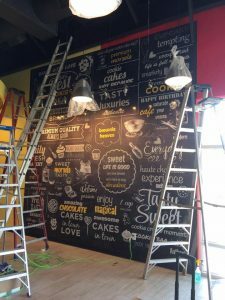 Whether you need interior signs or exterior signs, we can help you find the solutions you need to fit any business goal. We can fully customize all of your vinyl sign or graphics solutions to fit any business need, including banners, murals, and display elements in any size or design. You don’t even have to know what you need vinyl; our experts will discuss your signage needs to recommend the perfect vinyl solution for you! As your full-service Long Beach signs and graphics shop, we handle every aspect of your signage project. We begin with a free vinyl sign consultation where we listen to your needs, goals, and ideas. This allows us to recommend the vinyl products that fit your business, brand, budget, and intended use. 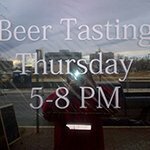 There are many options when selecting vinyl signs, and we are here to help pare down those options and present the choices that best fit your unique needs. We offer full design services for your vinyl signs and graphics, working alongside you to ensure your project matches your vision. We can work with any existing brand guidelines, or create new guidelines if you don’t have any specific designs in mind. Once you have approved your final design, our on-site manufacturing team will being fabricating your vinyl elements quickly, efficiently, and to your specifications. For most of our vinyl products, we offer professional installation to ensure it is free of wrinkles, warping, or bubbles, as well as being aligned perfectly. If your vinyl project is simple and you would like to self-install, we provide advice and tools for the best possible chance of success. 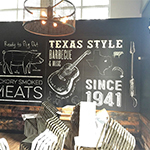 Exemplar Signs & Graphics is your local signage provider for the attractive, high-quality vinyl signs and graphics you need to build your brand, increase business visibility, and grow your business to the next level. Whether you need vinyl banners, vehicle wraps, window clings, commercial signage, or any other custom sign, we are eager to show you how our solutions will help you reach new marketing success. It looks great, very professional, and he did the job very fast. Go above and beyond to assist in your vision and really take the time to help make you successful!